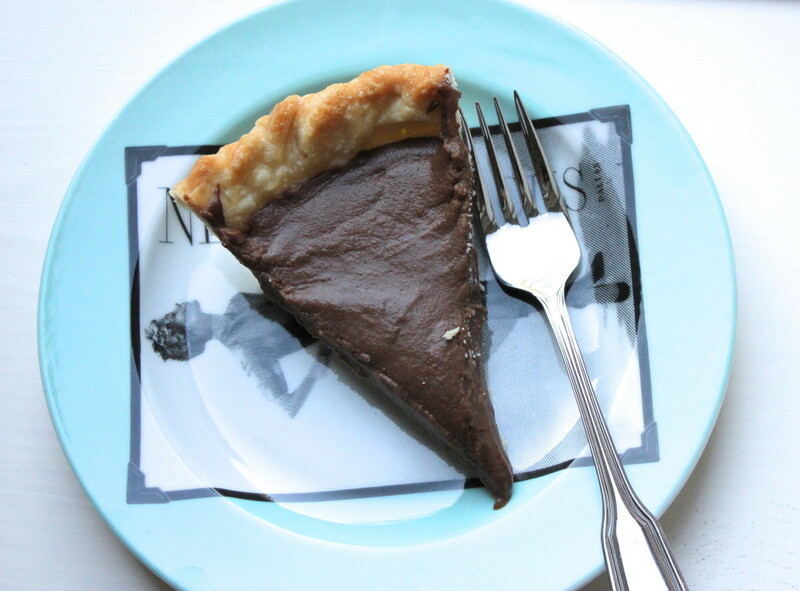 My mom found an new favorite pie crust and it has an unlikely ingredient: Vodka. Supposedly the vodka, because it is 80-proof, will mostly evaporate in the oven, meaning that the crust gets the liquid it needs but much of it will not stay. 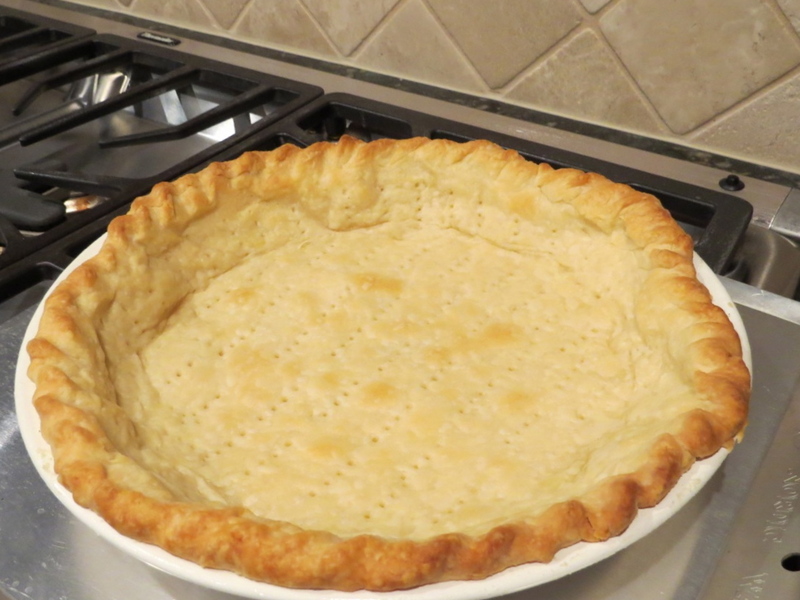 It creates an perfect pie crust with lots of flaky layers. Worried about the boozy vibe of your pie? Don’t be. My family doesn’t drink and thus we were worried about the same thing. According to Smitten Kitchen, vodka, by definition, is colorless and odorless, so once it’s baked, you’ll forget it was ever in there. It was my parent’s 38th anniversary last week, and Mom made my Dad one of his favorite desserts: chocolate ice box pie. 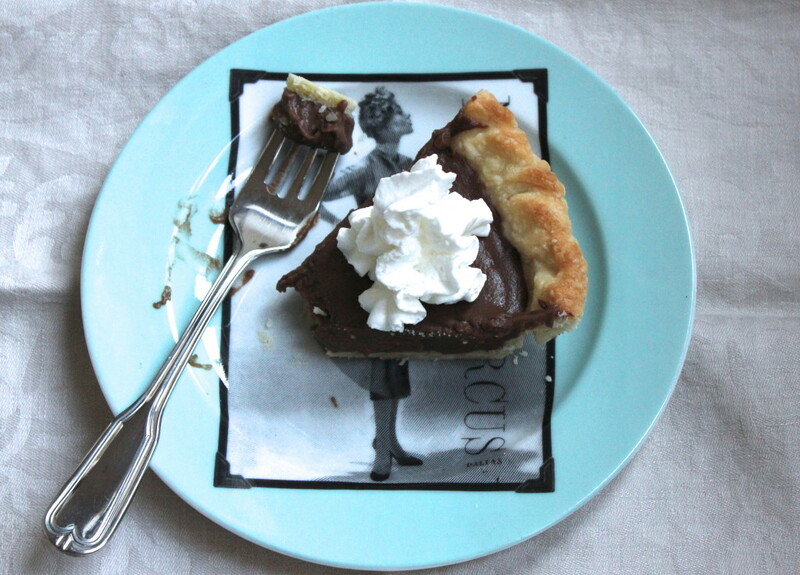 While I’ve blogged this pie before, we’ve never had a really good crust that we liked until now. We usually bake a store-bought crust to save on time. Plus Matt and Paula don’t even like pie crust. 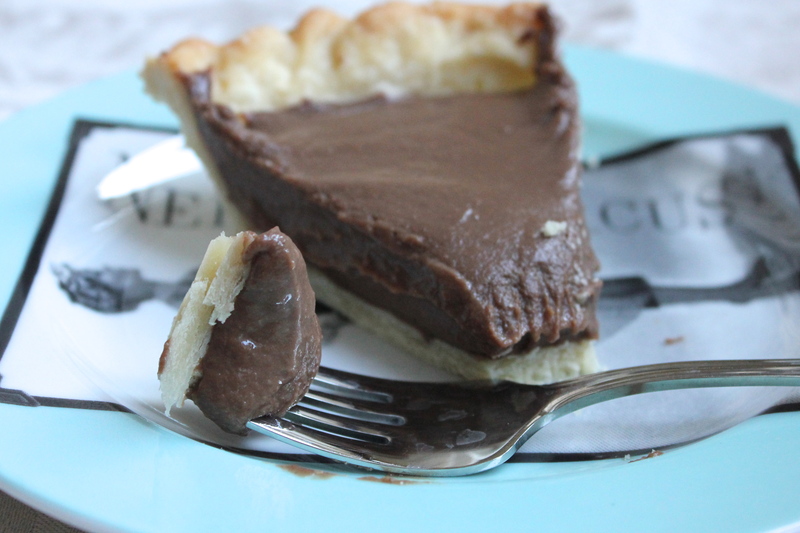 They will scoop out the chocolate, or whatever flavor pie filling, and leave the shell of the pie crust behind. 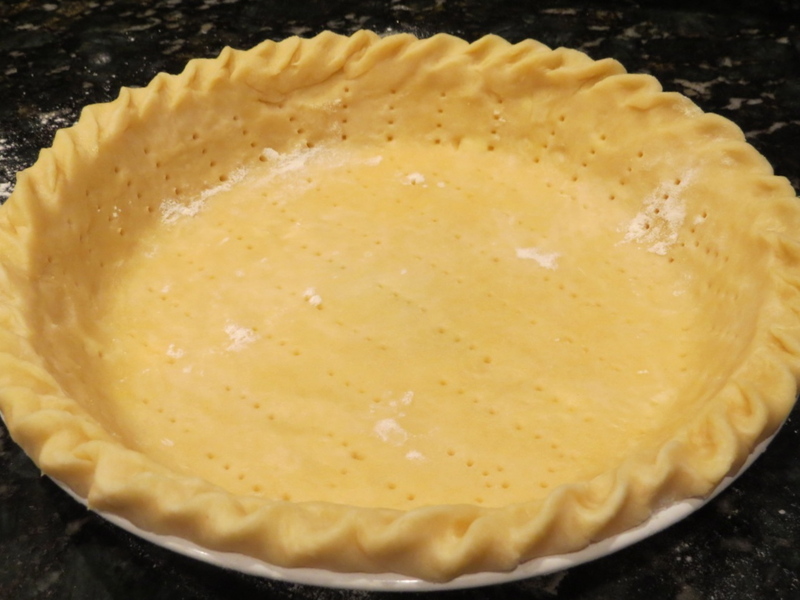 However, for those of us who LIKE pie crust (everyone else in this world besides Matt and Paula), we wanted a good crust recipe and found one! Prick the bottom and sides of the pie crust with a fork. Line with foil and pie weights and bake for 10-12 minutes at 450 degrees F.
Let cool completely, then pour in the chocolate pie filling. Look at all those flaky layers in the crust! I love these plates from Neiman Marcus. This one is tiffany blue, but there are three other colors: bubblegum pink, lavender purple and periwinkle blue. 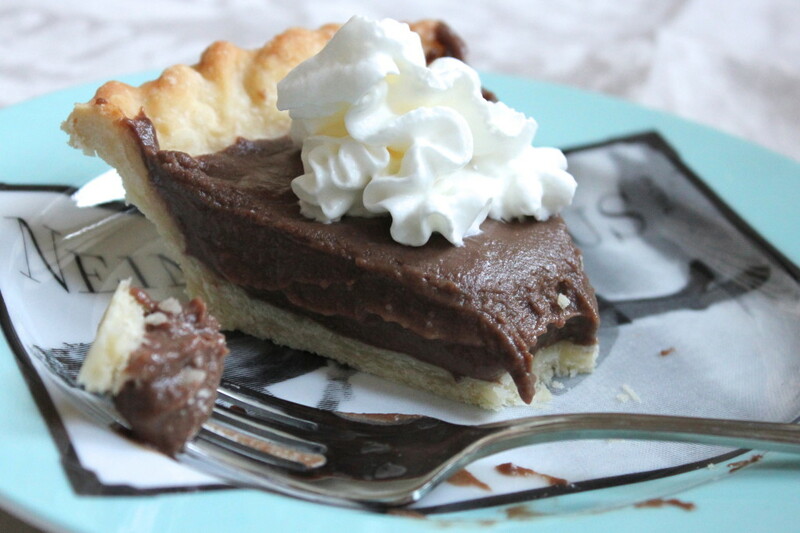 For the chocolate ice box pie recipe, click HERE. Process 1½ cups flour, salt, and sugar in food processor until combined, about 2 one-second pulses. Add butter and shortening and process until homogeneous dough just starts to collect in uneven clumps, about 15 seconds (dough will resemble cottage cheese curds and there should be no uncoated flour). To fit into a standard 9-inch pie dish, roll out the dough to a 12-inch circle. Carefully transfer your dough to the pie plate. Prick the bottom and sides of the crust with a fork. Line the pie crust with foil and add ceramic pie weights (rice or beans to will also work) to keep the pie crust from rising. Bake at 450 degrees for 10-12 minutes or until golden. Makes enough for one 9-inch double-crust pie. 2 Responses to "Foolproof Vodka Pie Crust and Dad’s favorite Chocolate Ice Box Pie"
I noticed this recipe uses only 1/4 cup of vodka. I bet it takes a lot of pie crusts to use it all up……… Leah can eat pie crust plain. As a matter of fact, Momma Momma will make her pie crust for a snack. She doesn’t need to get hooked on Vodka pie crust! Honestly, I figure it was a good crust……you you eat crust!